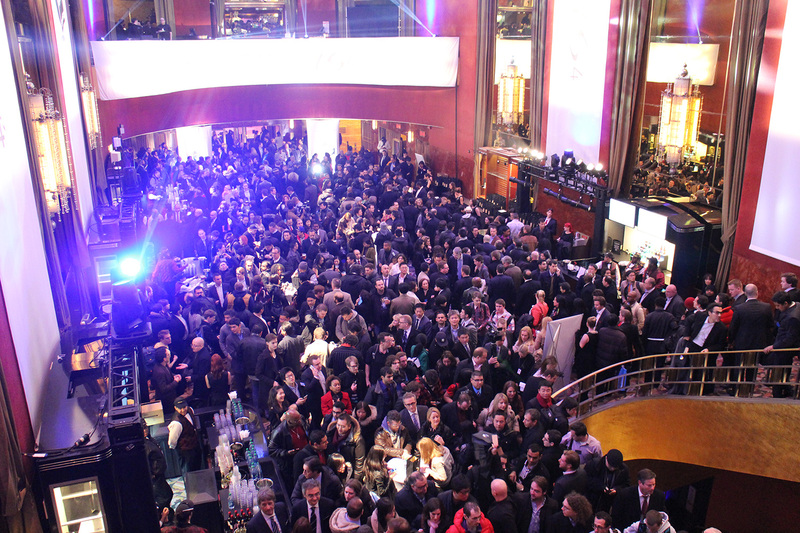 When word began circulating around the office yesterday that Samsung would be “taking over Times Square” as part of the Galaxy S4 launch, my initial reaction was, “Radio City Music Hall. The event is at Radio City Music Hall you nitwits. They’re, like, nine blocks apart.” These guys are going to handle our event coverage? But no, they insisted. 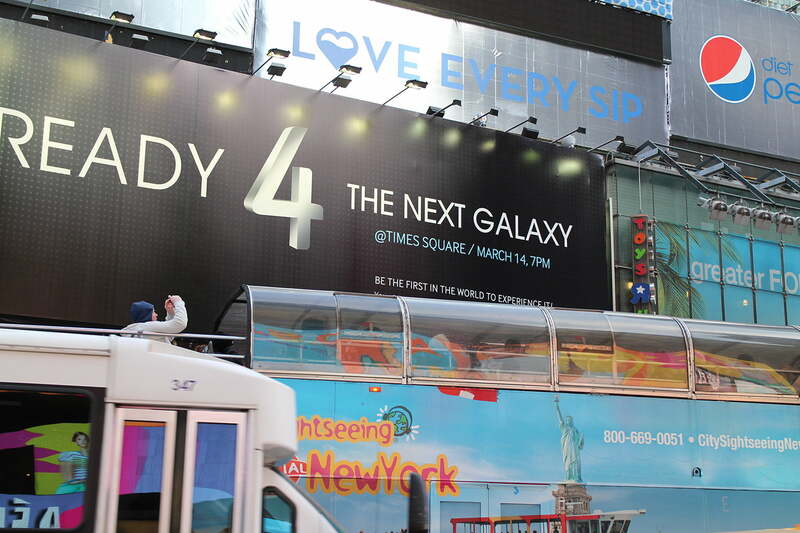 Samsung will also be “taking over Times Square.” This, I thought, was preposterous. First of all, they’re throwing a massive we-know-what-to-do-with-all-that-damages-money-the-judge-made-Apple-give-us-back event in one of the most famous theaters in the world; why would they need to “take over” one of the world’s most famous public spaces at the exact same time? So, while DT’s crack team of mobile reporters dispatched to Radio City Music Hall to rub elbows with New York City’s technological elite while eating canapés and sipping champagne in anticipation of the official product launch beginning engage in the foot-shuffling bloodsport of the media line, I armed myself with a digital camera and a notebook and headed to the Crossroads Of The World. A well-placed source at Samsung US ensured us that we’d want to be there by 6:30 PM – a full half hour before the Radio City Music Hall event was slated to start – if we wanted to see the fireworks. I emerge from the subway at 42 Street and 7th Avenue with 20 minutes to spare and immediately begin scanning the everyday mob scene that greets anyone unfortunate enough to find themselves in Times Square at any moment following, say, 1998. There is no immediate sign of the impending invasion, but then what takeover worth its salt would telegraph itself anyway (I mean, any more than by having representatives from the taking over company confirm the takeover)? I would have known to expect little. 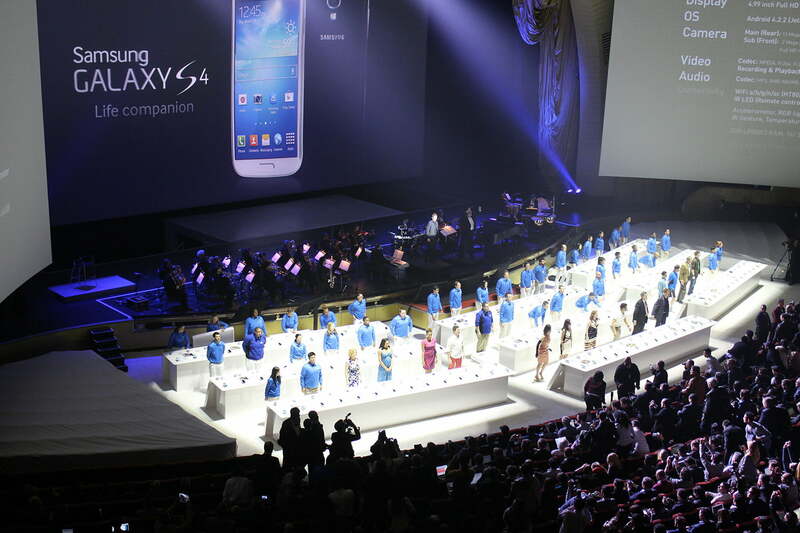 After all, if that was Samsung’s definition of a “flash mob,” things were bound to be underwhelming. I trudge toward the viewing area, tucked into a corner of Duffy Square, better known before tonight (and also immediately after and forever more) as the home to that big red staircase on top of the place that sells tickets to Broadway shows. Aside from the screen, there are 10 or 15 rows of seats set up, and a small crowd of curious spectators waiting to be let into the square, which has been sectioned off with police cordons. They are let in at 6:30 on the dot, an “invasion” one hundred strong, trickling into a space where they’re matched, nearly one-for-one, by inordinately cheerful Samsung reps wearing jackets in the company’s distinctive Smurf blue. 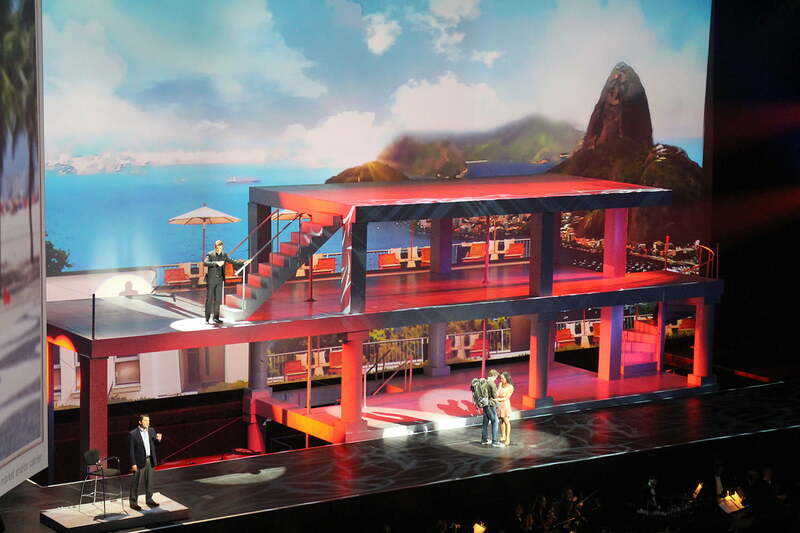 For the next half hour, the crowd increases by another few hundred people, while the world’s lamest hype man attempts to start a wave, followed by a call and response game that consists of four people on one side of the square shouting “What’s in!” while two people on the other side shout “The box!” Meanwhile, the ad campaign featuring the insufferable brat Jeremy plays on an endless loop. Were it not for the Aerie.com billboard showing scantily clad women frolicking in beds directly above Jeremy, I wouldn’t have lasted more than five minutes. Did I mention it’s about 28 degrees? The cold doesn’t keep people from continuing to stream in, although it’s unclear how many of them are to check out the S4 launch event, and how many of them were simply corralled into area by the endless maze of cordons that – depending on your taste for conspiracy theories – either govern efficient pedestrian flow through Times Square or exist to ensure no one ever leaves. Speaking of conspiracy theories, some press guys behind me suspect there’s a hidden meaning in the fact that a scene in the commercial shows Jeremy untwisting an Oreo and then twisting it back together before opening the mythical box at the center of the entire S4 marketing campaign. It’s a fair question; I last another 15 minutes, until the screen (and, to be fair, the big billboard that just a moment ago showed a woman in a bikini rolling in the surf – two billboards out of a gazillion, not bad!) switches over to a live feed from Radio City Music Hall. The lights are down, last-minute tech staff scramble across the stage making preparations. It occurs to me that the chances of anything beyond a live stream and a few more games of “What’s in!” “The box!” happening are effectively nil at this point. I could watch this thing in the freezing cold or I could walk nine blocks to the event. I wish the guy next to me well, he looks at me quizzically before saying something in Russian, and I bail. A half an hour ago, apparently, hundreds upon hundreds of media members lined 50th Street in a disorganized scrum, trying to reason with clipboard-wielding event staff who tried to reason with them back as no one got it. Meanwhile, guerrilla representatives from HTC and LG picked people off with snacks and hot chocolate, in exchange for down and dirty demonstrations with those manufacturers’ flagship phones. But that was then. Five minutes after the lights go up inside, I walk unimpeded into the art deco temple that is the Radio City Music Hall lobby. A few too-cool attendees sip free booze, but the yawning space is populated almost exclusively by bored-looking women in short black cocktail dresses and elbow-high black gloves who man the stairwells. I remember the Smurfs a few blocks back and feel bad for them; these ladies look much warmer. 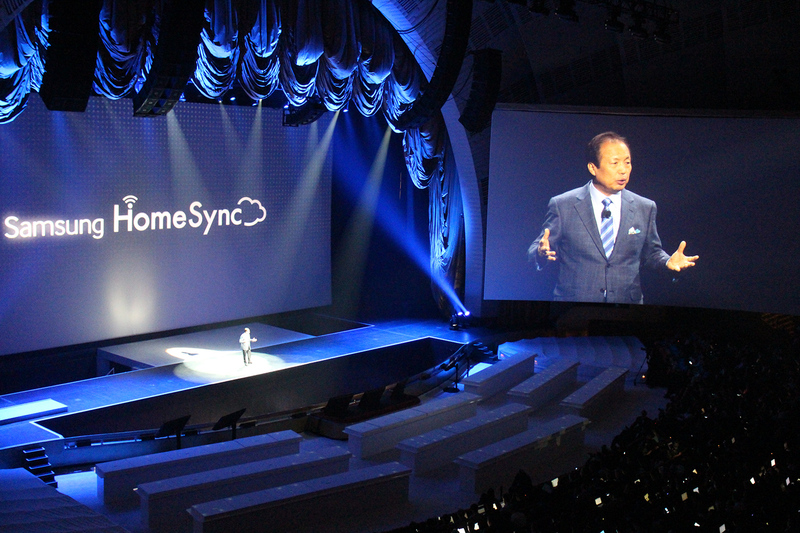 I climb to the third balcony before finding a seat – it’s an impressive turnout considering the place has a capacity of roughly 6,000 – and drop down next to two intent-looking gents just as JK Shin, the global head of Samsung Mobile, introduces to the S4. The smattering of applause would sound more impressive in a less cavernous room, but instead sounds like it’s being swallowed by hundreds of gruff tech writers wielding journalistic integrity. But as Samsung Director of Product Marketing Ryan Bidan takes the stage and begins rifling through the phone’s specs, even the hacks start to get excited. And why not? On paper (or a massive screen, as the case may be), the S4 is a beast. A paper cut-inducing 7.9mm thick and weighing in at just 130 grams, the phone (in the US, anyway) will boast a quad-core 1.9GHz Snapdragon S4 pro chip powered by a 2,600mAh battery. The gaggle of sensors – infrared, proximity, temperature, barometer, gyroscope, accelerometer – get some ooh’s and ahh’s, but it’s the screen, a 5-inch, 1080p gem packing 441ppi pixel density that finally tips them into nerdgasm. Cheers erupt and the two guys next to me giggle and slap high fives. But that’s it for the look under the hood. Their enthusiasm aside, this suite of software is clearly designed for caricatures of the average consumer. Like a lot of Samsung’s recent mobile products, it all comes prepackaged and preloaded, almost as if the company’s response to Apple’s “There’s an app for that” campaign is to interrupt you before you can buy that iPhone and swear, “You don’t need an app for it! We have it all, right here!” But baking functionality into the phone only works if the functionality isn’t half baked. I’m reminded of Samsung’s Galaxy 10.1 launch event last September, when I watched Hollywood super director Baz Luhrmann display that tablet’s functionality from afar, only to find the functionality stuttering and unreliable when I played with the device just a few minutes later. As the presentation ends, the Smurfs make their appearance, manning tables throughout the auditorium and mezzanines where hundreds of S4’s are tethered for hands on display. 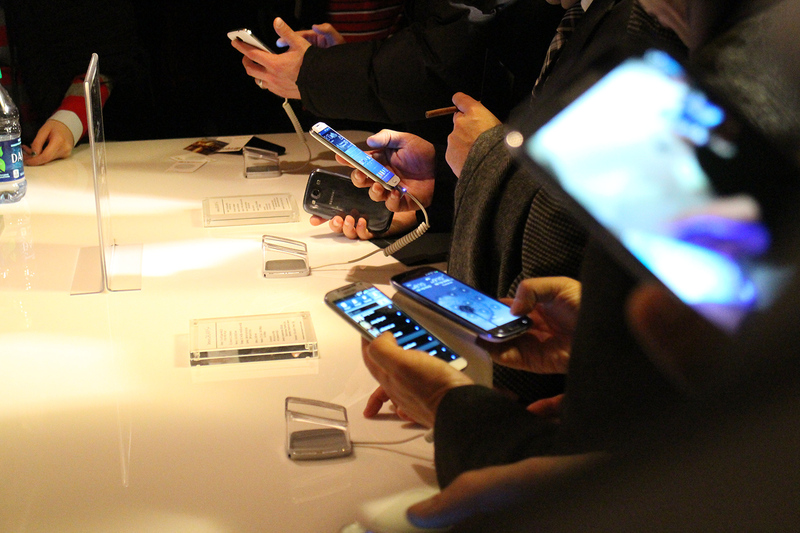 The wait for a device is long, giving me ample opportunity to see the software put to the test by multiple people. One by one they speak into the translator or try to activate the Smart Pause that stops a video when your eyes look away or flip horizontally through screens without touching the glass. The success rate for everyone is about 50 percent. Finally, it’s my turn. I spend a few minutes poking around the photo-editing functions (“Who needs Photoshop when you have Drama Shot and Story album?”) and the fitness functions (“No need for that Fuel Band anymore!”), before trying my luck with the “Life Task” functions. I subtly shift the phone toward me and away from me, hoping to get a New York Times article to “Smart Scroll.” After a few minutes, one of the Smurfs digs through the settings menu with an exasperated sigh and activates the function, at which point it works so well that I get vaguely motion sick trying to keep up as the page disappears into the top of my screen. Then I try the “Air Gesture,” initially making subtle swiping motions across the screen before getting incrementally more demonstrative. Pretty soon, I look like I’m trying to put out a small fire in the phone, but the screen goes nowhere. I can’t bear the Smurf’s withering stare a second time, so I leave it at that. At this point, the crowd has thinned out and things are winding down. 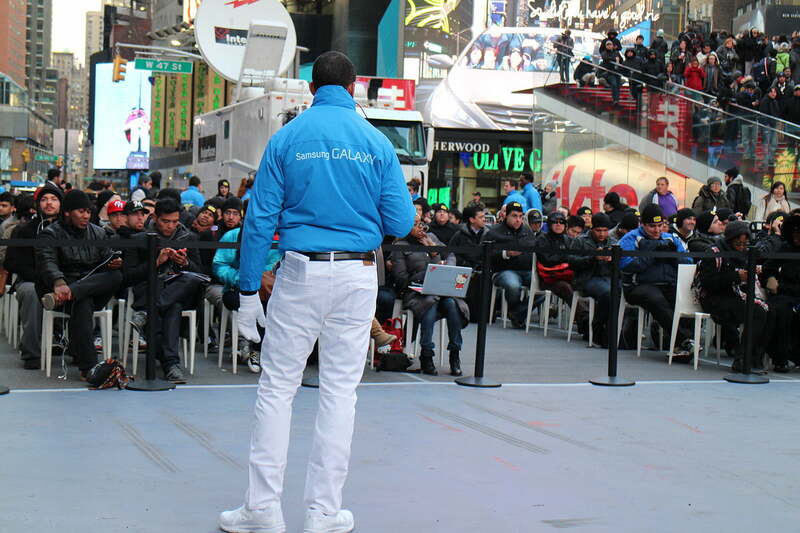 I decide to hoof it back to Times Square and confirm that there was not, in fact, an actual takeover. As I approach from behind the big red stairs, it’s clear that whatever crowd had gathered has mostly dispersed. The screen is dark. The beautiful women have returned to the billboard above, and the Smurfs are huddled together in small packs or manning a consumer version of the hands on display that I just left. The journalist in me wants to sidle up alongside one of those consumers and see if this remarkable new phone with the breathtaking specs and the Life Companion software suite is everything they ever hoped it would be and more. Would they actually use the fitness functions? Do they, in fact, find touching their touch screens to be too onerous to deal with? Does fondling the S4 make them regret their five month-old iPhone purchase? But the New Yorker in me just wants to get the hell out of Times Square, and the New Yorker wins. For all I know, Samsung initiated a massive military raid on the place moments after I left. If they did – and if anybody noticed – I’ll read about it tomorrow.